David W. Jackson, MD, uses a diamond blade to make a 1.8mm incision temporally. 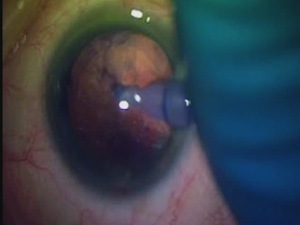 After removing the cataract, a Softec HD aspheric lens (Lenstec) was inserted in a wound assist manner through the microincision. The lens unfolds slowly, allowing the surgeon to ensure the leading haptic is positioned in the capsular bag. THE REXIS MUST BE SMALLER THAN IOL OPTIC!